originally published in Bad Subjects #53 "Alienated Labor"
When you enjoy a stretch of supporting yourself in a position that makes the best use of your technical, political and even moral energies, it makes subsequent moments of its absence even more acute. 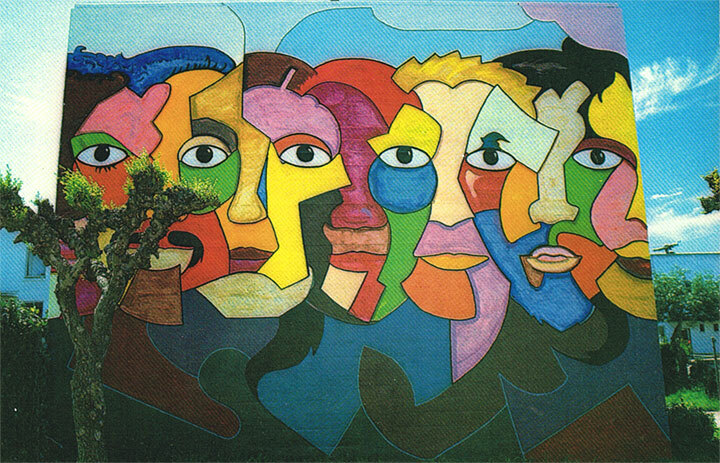 Mural © 1980 by Mike Mosher at Holly Courts Housing Development, Politec acrylics, 22' x 25'. Funding from Mayor's Office of Community Development, dedicated July 1980. Whitewashed out by Housing Authority, City of San Francisco, October, 1980! Perhaps it is dangerous to have what feels like the perfect job. When you enjoy a stretch of supporting yourself in a position that makes the best use of your technical, political and even moral energies, it makes subsequent moments of its absence even more acute. You stew in the full realization that it can be done, that such a life does exist. The best job I ever had was as a community muralist for the San Francisco Art Commission for seven months in 1980-81. It is possible, in our market-dominated society, for an artist to exist in an urban "socialist paradise". The rest of my working life has been trying to recapture that sense of purpose, achievement and freedom. The failure of society to provide roles like these is a reason many younger artists shy away from identifying as artists. My advanced study as a community artist was a 'scholarship' on the CETA payroll. The Comprehensive Employment and Training Act (CETA) received federal funding from 1975 until 1981. CETA arts programs fell under two sections: Title II and Title VI. Title II accounted for 12 percent of CETA positions by 1978, and was targeted at economically disadvantaged communities including African Americans, Latinos, underprivileged whites and seniors. Title VI programs, which accounted for 54 percent of CETA positions by 1978, provided counter-cyclical public service employment that gave jobs to artists and others in the midst of rising unemployment. Overall, arts jobs accounted for only two percent of Title VI public service jobs. A public service orientation gave priority to projects serving the greatest number of people, or economically disadvantaged groups traditionally under-served by cultural institutions. CETA's arts contribution took the form of murals, paintings, photography and sculpture in public parks, public schools, agency lobbies and waiting rooms. A strong secondary priority was to provide meaningful artistic experiences for artists. CETA employment suspended career pressure for a short time and allowed artists to work for an immediate audience without financial worry. In annual surveys in one large city, the number of CETA artists who had fully supported themselves the previous year as artists ranged from 12 to 21 percent. Those who had supported themselves working as artists for any full year prior to the program ranged from 42 to 47 percent. In short, CETA programs were government-sponsored entryways into the arts. The California Arts Council estimated that CETA funded a total of10,000 arts positions nationally, although it may have been nearer 16,000 including both artists and arts-related workers. Total CETA arts expenditures were $300 million during the life of the program. In one US city in 1976, with a program larger than San Francisco's, there were 203 artists and cultural workers at an expenditure of $1.5 million. Workers received monthly salaries of $750-800. At this time in the United States the rule of thumb among ambitious white-collar workers was that your income should be your age times a thousand, so a successful 25-year-old should have been earning $25,000 rather than CETA's $9,000-9,600. For an artist, CETA employment was a chance to catch your breath, to relieve you of funding urban survival needs, and allow creativity to run free. Rather than work in a meaningless 'day job', you saw your artwork and workshop teaching affect the lives of its immediate public. Despite its social benefits, the general public viewed CETA skeptically, with sentiment against it being stirred by conservative politicians and media. The right wing and some newspapers charged the program with mismanagement, improper supervision, and insufficient work. The General Accounting Office finally investigated. There were some instances of petty corruption and bribes to secure jobs, but the most common abuse was the use of CETA funds to pay regular government hires. At one point half of all New York City's zookeepers were paid with CETA funds. My mother urged me to leave off my résumé the fact that my job as a community muralist for the San Francisco Art Commission was CETA-funded. I refuse to believe we were a tainted brood, though often that part of my career has met with indifference. I was the last "Community Muralist Trainee" funded by CETA. Contradictions with original program purposes were evident in the fact that I was hired with a Dartmouth College BA in hand, rather than one of the unemployable workers CETA supposedly targeted. Yet all around the country, rather than "training", CETA art positions resulted in a brief flowering of grass-roots public art. For my take-home paycheck of $90 a week I would meet with nonprofits and neighborhood or school groups that wanted guidance in developing and painting a mural. Or I rode the MUNI to different San Francisco neighborhoods to examine prominent wall sites that might qualify for a block grants for murals. Every couple weeks I met with my supervisor, an intense French-born bureaucrat delighted by François Mitterand's election that fall as Prime Minister and his flashy Minister of Culture Jack Lang. I listened for an hour to her complaints about her fellow art bureaucrats until she got around to asking about the progress of my projects. In my nine months on the CETA payroll I completed three murals. My adult workshop produced an 8' x 32' mural for the garden of the South of Market Cultural Center that represented the signs of the zodiac with various San Francisco cultural types (Cancer the Crab as a bottle-clutching wino, Aquarius as a punk rocker with water pouring from his guitar). At the Josephine Randall Junior Science Museum I painted a 12' x 24' mural of wildlife on the San Francisco peninsula before the city was built. The Club Latino of St. Peter's Elementary School needed direction painting a 6' x 20' wall. It was all a gas. The muralist job wasn't financially fat, and for many years my involvement returned little to me in the form of traditional art career rewards, like university teaching. The most important part was that a sufficient number of fellow artists and audiences grew involved in the work's dialogue for it to feel very satisfying, and to nurture continued creativity. After Reagan's ascent made catfood of CETA, a couple Mayor's Office arts grants flowed my way. Tim Drescher's San Francisco Murals 1915-1990 documents the results of these grants and CETA projects. When San Francisco's artistic pumps were clearly primed with public support, artwork and contact with working artists moved from the swank downtown to the multiethnic neighborhoods. Without that public support — and sometimes even with it — class barriers and private sector codes reassert themselves, to the discomfort or exclusion of the majority. There are many more politically-conscious photographers, poster- and printmakers, musicians and poets who could recount similar tales of their best talents being employed in a supportive public or nonprofit sector. It was a time of excitement, growth, and political education for artists in their flexible twenties. Through my nostalgic buzz shoots a fear that I'll never feel as prosperous and productive an artist-citizen as I did in those days. Gay men once expressed delight at how in San Francisco's Castro and Polk Street neighborhoods they could work and shop exclusively in gay businesses, live in gay buildings, rarely having to deal with straights. Similarly, twenty or twenty-five years ago politically-committed artists in the Bay Area could thrive in a multicultural and leftist political and community arts milieu. They could find creative sustenance and opportunity in a world populated almost entirely by their own kind. By age 25 I had stopped paying any attention to galleries, museums or the Art World establishment. Instead I saw my work in relation to my neighborhood, diverse communities, current events and political struggles. A year studying with African American muralist Jon Onye Lockard had made me realize how art could serve human liberation. I then left Michigan for California. Together with some anti-consumerist personal austerity, I was helped by the historical fact urban costs were more manageable then. A San Francisco MUNI bus pass was only $18 a month, so no car was necessary. Having found my apartment by starting at the lowest prices in the want ads, I moved into the Fillmore neighborhood, nearly the only white guy in what I discovered was known as an African American ghetto. A few hours work as assistant manager of my tiny Fillmore Street apartment building got my rent halved to $75 a month. Besides cultural centers like La Peña in Berkeley or those in San Francisco run by the Neighborhood Arts Program, plenty of bookstores, cafes and ice cream parlors offered walls for exhibits of small works. There were occasional studio sales to a few supportive collectors which, combined with part-time jobs like bartending, phone surveys, or unloading truckloads of blue-chip art, could meet most normal expenses. My first mural commission in San Francisco had supplies overruns (which veteran muralists advised me to build into the budget) that resulted in a stockpile of high-quality Politec Mexican mural paint which got me through two graduate programs, and that I still use twenty years later. SCRAP was an industrially-salvaged free art supplies organization providing big rolls of paper that met my needs. I checked dumpsters assiduously, especially for luxuries like furniture. By not having a television insidiously blaring the sculpted and salted fruits of capitalist economy, all desires were kept within immediate satisfaction and my dreams were my own, not those of the global consumer zeitgeist. ILWU Mural-Sculpture, 1984-86: Celebrating the 50th anniversary of the 1934 SF General Strike. Artists: Miranda Bergman, Tina Dresher, Nicole Emanuel, Lari Kilolani, James Morgan, Ray Patlán, Eduardo Pineda, James Prigoff, O'Brien Thiele, Horace Washington. Today the piece has been moved to the corner of Steuart and Mission where it sits against a newly built hotel. I left the San Francisco murals scene a few years later, tired of its supposedly socially-conscious artists backbiting and claim-jumping for grants, feeling that too many muralists only did artwork when a check arrived. The neighborhood-based mural-painting scene survives in San Francisco, still producing projects that are usually spearheaded by fifty-something "community art professionals". It's not a bad thing, but I'm not convinced it is bringing sufficient numbers of younger people into the fold. Two community muralists in their forties, Juana Alicia and Johanna Poethig, continue to develop distinguished public works, though most working community muralists seem to be a decade older or younger. It is the younger group that is most imperiled. The Clarion Alley muralists arose in the 1990s, committed to soulfully decorate the same Mission alley where I had a loft. They secured grants from various San Francisco foundations, and painted a range of human-scale projects. They held street parties with deejays and punkish bands. It was a delight to see the alley so crammed with dancing bodies that you couldn't quite tell where the living, breathing humanity ended and painted figures on the walls began. 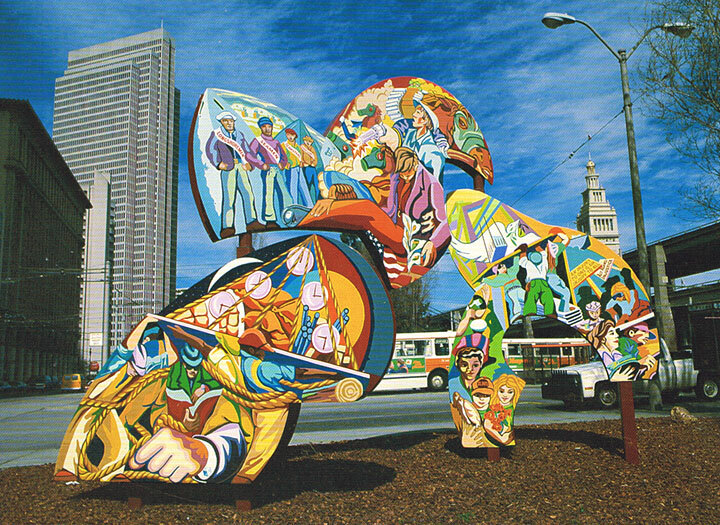 Many murals, such as "Faux Mission Man" by the syndicated cartoonist ("The K Kronicles") Keith Knight, were like a comic strip or in the stylistic manner of an alternative comic book from Fantagraphics or Drawn and Quarterly. The late Chuy Campusano, an older artist from the first generation of San Francisco community muralists, painted a stirring swirling political graphic alluding to those that went up nocturnally during the Pinochet years in Chile. The eclecticism of the block was striking, and the artists went on to similarly paint the lobby of the Redstone Building, long home to many unions and nonprofit social service and arts groups. Yet the San Francisco they inhabit draws increasingly further away from my own. Many arts groups have been forced to close their doors as a result of skyrocketing rents. The city may never recover its cultural — and especially leftist — edge. Three buildings on Clarion Alley are slated for demolition (including one painted like a storage locker housing comic book heroes Wolverine, thee Thing and Martha Washington), to be replaced by expensive yet shoddy market-rate housing that slipped past the Planning Commission in the guise of "artists lofts". Surfing the tsunami of gentrification, some savvier artists have secured generous five-figure relocation deals with their former landlords. Their neighbors, especially Latinos who have lived in the Mission for decades, have been less fortunate. What is it like for most artists in contemporary San Francisco? An essay like Kim Nicolini's 1996 essay "Who Owns Art?" encapsulates what young artists encountered in the 1990s, leaving me with terrific melancholy. Nicolini's clearheaded appraisal of the contradictory situation of artists and her satisfying anecdotes of helping connect young people with poetry and art in empowering ways is darkened by a feeling of great isolation. Her work with visual art and poetry has been done in a constricting and unsupportive vacuum. She expresses a feeling that she has touched a few lives but it has been too little, too late; her contribution is too easily forgotten and eradicated by the grimness of people's daily lives. Nicolini argues that there is insufficient meaningful connection between her own creative efforts and her teaching of cultural heritage. But in a sense perhaps nowadays only an artist pained by an indifferent, unjust society and constantly trying to relate their work to its deep generative social currents, deserves the appellation "artist". The majority of downtown artcraft-makers are decorators, putting colorful unchallenging formal exercises onto collectors' and institutions' walls. Or they're installers of ironic assemblages in ghettoized "art spaces" for viewers primarily from their own class (yawn), works which are entertaining but essentially trivial. This social role as a courtly entertainer doesn't really hurt anybody, but neither does it matter much. I keep reminding myself that such distortions of an artist's role — through market-specialized alienated labor — is theirs, not mine. I always imagine a befuddled viewer in the future saying "He lived in an America with issues like that to deal with and he only did THIS???" I don't believe a person wearing a tuxedo has ever viewed my work. John Berger once wrote that he evaluated art work with "Does this piece help people to gain their social rights? ", which can lead to a very broad celebration of stylistically diverse artwork (not just radical posters) when applied by a humanistic thinker like himself. About 1980 I told the poet Ron Silliman that his life, incorporating his job publishing the Tenderloin Times and running the Tenderloin Writers' Workshop, plus his political activism around urban housing issues and teaching at the San Francisco Socialist School, all balancing with his writing as a leading Language Poet, was for me an exciting example of a creative life. He laughed and said he rarely felt the connections, only the breach between them. I never hesitate to identify myself an artist. I used to argue with fellow leftists who preferred the term "cultural worker". I saw that terminology as abrogating their responsibility to be the best artist possible. Art traditions matter: I intuitively identify with those who made art in the past in order to apply their techniques today. Often I feel this connection more than I do with my apolitical contemporaries who have made art their careers. The true blessing is for creative longevity; art takes extraordinary effort (like most, mine has faltered or piddled along on half a cylinder for long stretches), committed to production without financial reward. Good art lies in commitment to taking the time out of daily distractions to make something that wasn't there before, something that you think matters. In most art schools, civic art committees controlling public funds, local art fairs and associations, art is reduced to the level of attractive craft rather than a manifestation of philosophy, psychology and politics. Craft is a good thing, yet too often serves only as a conversation piece upon the walls and coffee tables of the petite bourgeoisie. How can public art positions be once again implemented? Art schools and universities might provide combination scholarship-internships, where not only is class credit given for community arts projects linking artists with seasoned neighborhood nonprofits, with the students' material needs met as well to prevent the compromises and distractions of the gnawing stomach and landlord at the door. Yet public universities are funded at minimal levels, as the Republican party tries to paint teachers as the enemy within. Most likely a new flowering of community arts conciousness that hires fulltime artists won't happen in our privatized era, when all over the social safety net has been shredded. It was only because of the breadth and strength of progressive social movements of the 1930s and 1970s (implementing the promise of the 1960s) that community-based artists' programs employing artists were ever implemented throughout the United States. I was fortunate to have caught breezes at the 1970s tail end, enough to educate me, perhaps intoxicate me,to the possibilities. It is when people demand their basic human rights that they look around them and realize they can demand art in their lives (and their lives in the art) too. Among these currents the young artist learns to negotiate between maximum group involvement and maximum democratic process, between group content development and the artist's educated understanding of form, between the community's subject matter and your own personal motifs and current aesthetic obsessions. To stay afloat in these roiling rapids is whitewater training in dialectical process and practical politics. And gad, it's fun. Hopefully San Francisco — and the rest of the nation — will once again give young artists the jobs and the societies that let them rise to their creative heights in serving the people. Mike Mosher teaches art and multimedia at Saginaw Valley State University. Thanks to Joe Lockard for editorial suggestions.